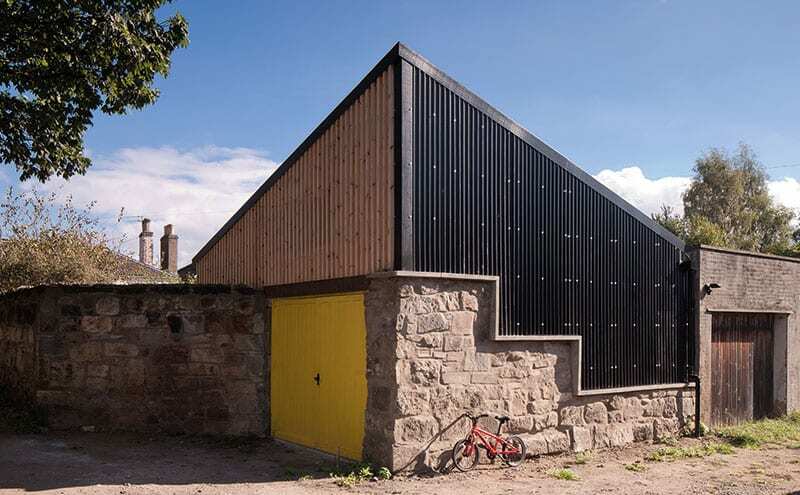 Black corrugated cladding from Cladco combines effectively with the original reclaimed stone of the old stables and the strips of larch. The pyramid shape was chosen as it gives the most space without overshadowing the neighbours. Portobello, Edinburgh’s seaside suburb, has more than its fair share of interesting new architecture to go along with its traditional tenements and Victorian villas. Konishi Gaffney’s Japanese house, A449’s stables conversion and Chambers McMillan’s ‘ramp’ house have all won plaudits in recent years, and now the trans­for­ma­tion of a crumbling garage in a back garden is generating similar acclaim. 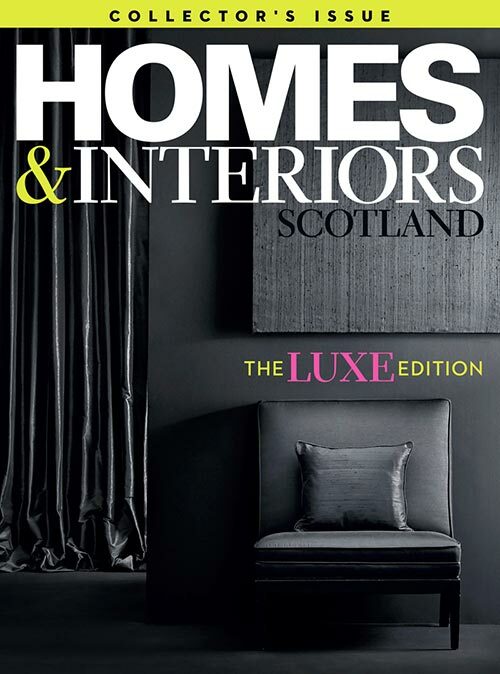 They spoke to their friends Ian and Thea McMillan, principals of local practice Chambers McMillan, architects of the aforementioned ‘ramp’ house. “We were looking for advice and trying to work out what sort kind of budget we’d need,” says Ina. 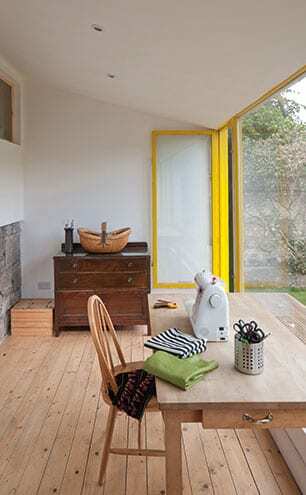 Eventually, she and Ian came up with a clever design that combined three ideas in one – a workshop, studio and den space. 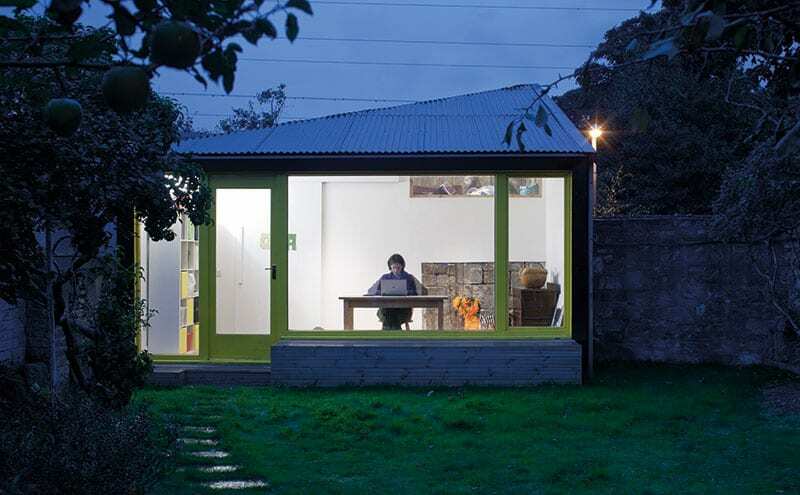 It has been extended into the garden with Ina’s glass-fronted studio section facing the back of the house. The studio connects the building more meaningfully with the garden, with a bench along the long glass façade now providing a favourite place to sit in the sun. 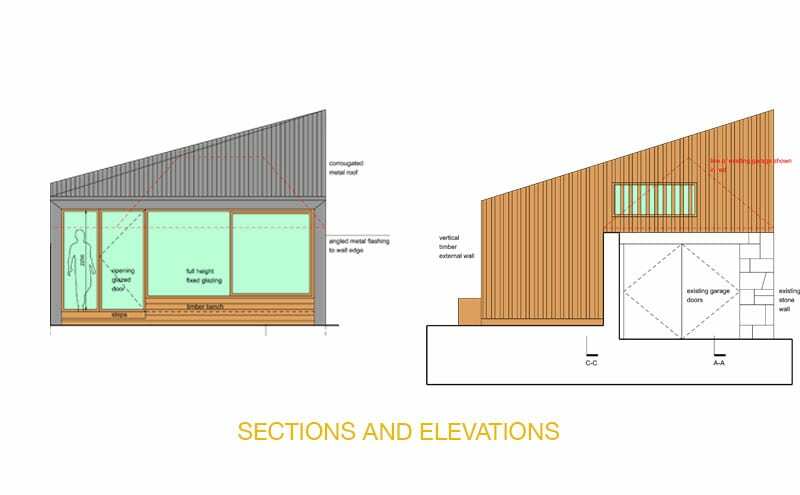 A workshop space has been retained to the back of the building, with a mezzanine area created above the studio. This was made possible by the asymmetrical pyramidal roof. 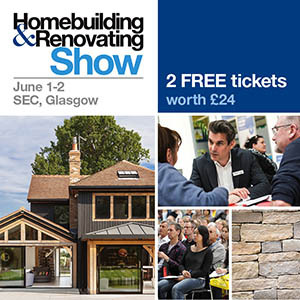 “We did a lot of 3D studies to ensure the new roof wouldn’t overshadow anyone,” Thea explains. 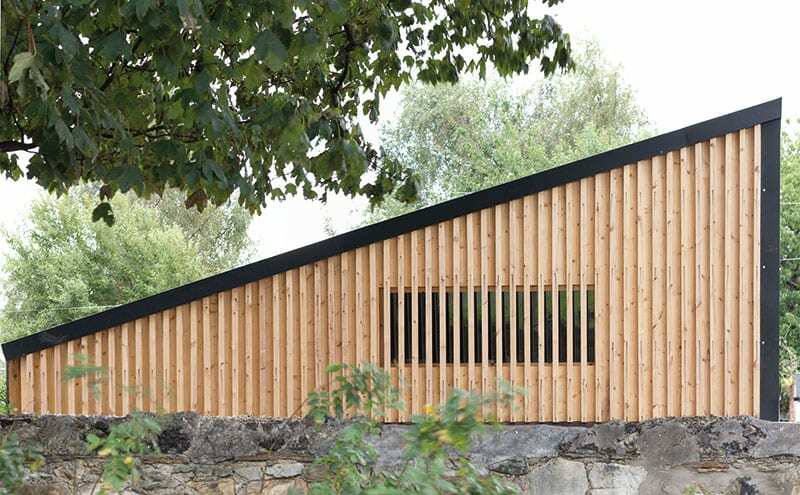 “That’s why it’s this shape – it gives the optimum space within, without overshadowing any of the neighbours.” The concealed window behind the strips of larch cladding allows those inside to see out but not be seen themselves. 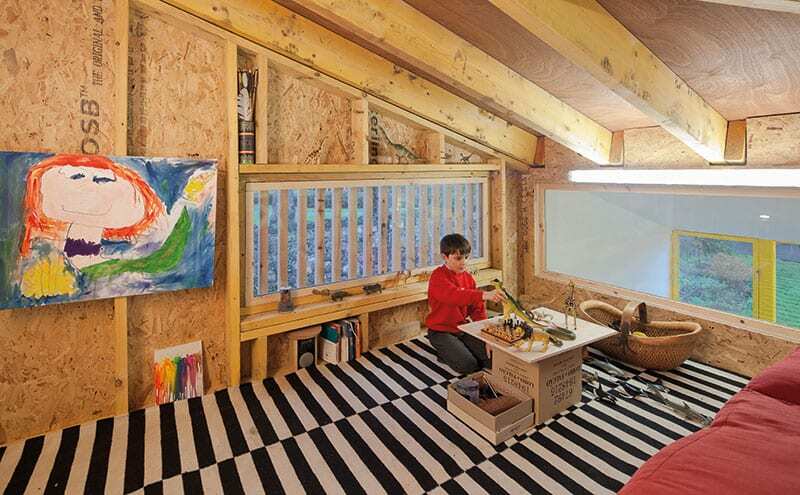 The mezzanine, nicknamed ‘the treehouse’ by the children, has been left with its rough-and-ready OSB boards exposed, which suits the look and feel of the play area. The window is hidden behind the strips of larch cladding. The sharp edges and clean profile of the roof offers an interesting contrast with the rustic buildings and tin shacks that inspired it. Keeping within the £40,000 budget was a challenge. To save money, the family took on the tasks of painting the interior and sanding and varnishing the floors. They also decided to insulate the studio but not the workshop or mezzanine. “We thought of putting in more insulation later but it’s working out really well the way it is,” says Ina. The mezzanine, also known to the kids as ‘the tree­house’, is a favourite hangout, with a great view over the park next door. And in the workshop James has room for all his tools. “It’s an extension of our home, yet at the same time it’s separate enough to be a different space to retreat to,” says Ina. Everyone is happy.